After hearing about Aquaponics, many people have the throught of growing plants on floating rafts in their existing fishpond. Sounds like a great idea - fish poo, plants take up nutrients and grow. Sounds simple, but does it work? Cris Gaston at the BYAP forums (nickname is crisgaston) recently did an experiement in the Philippines - over there there are many fish enclosures and the thought was to find out the cheapest way to be able to get a second crop for the fish farmers. If it was possible with minimal expense to grow plants in the fishponds, then this would create another income for the fish farmers and at the same time create a cleaner environment for the fish. 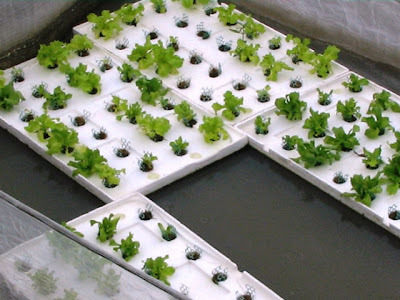 For the experiment, lettuce would be grown in floating ratfs directly in the fishponds. 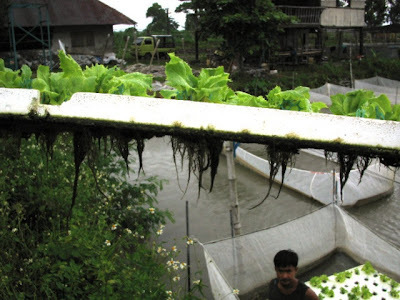 At the same time, lettuce in floating rafts would be grown in a traditional RAS raft system (RAS - Recirculating Aquaculture System). This would allow a comparision between the two. Here is a picture of what the lettuce looked like after 35 days. Very stunted growth and only a 50% survival rate. 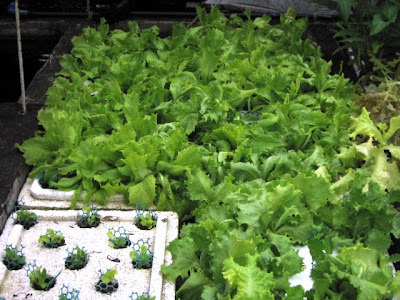 Lets compare this with a picture that shows the RAS floating raft lettuce after 35 days. In the bottom left corner are are lettuce that were directly in the fishpond and the rest is from the RAS system. As you can clearly see, there is no comparision between the two. Why these results? What went wrong with the floating raft in the fishpond? To answer this, lets look under the floating raft at the roots. The roots show the causes of the problem. The roots show signs of root rot and are covered in a dark muck that coats them. If you were to take a hose and wash the roots down, you will see that there are white roots there (which is what you should be seeing). Instead, the roots are dirty. Why are the roots dirty? It virtually creates a "barrier" between the root and the water. This prevents the plant from uptaking oxygen and minerals from the water. This will lead to root rot a cause nutrient deficiences in the plant and hence stunted growth - this is very obvious in the above photo. There are some aquatic plants that grow happily in an environment where the water contains solids - but you will not be able to grow vegetables this way due to the solids build up on the roots. How do you remove the solids from the water? There are many ways to achive this - in most backyard Aquaponic systems gravel, expanded clay or a dedicated solids removal device (like a swirl filter) is used. There is a catch to solids removal - you don't want to remove the solids - as they need to go through a process of mineralisation. Mineralisation unlocks the minerals in the solids into the water to make the minerals available to the plants. Gravel does this by catching the solids and giving it time to slow breakdown and mineralise into the water. The biofilter provides a space for good bacteria to grow that converts the fish waste (ammonia) into nitrates (nitrogen) that the plants can then easily uptake and use to grow. In most backyard system, a gravel growbed is used to grow the plants - this growbed provides 2 functions - both solids removal AND biofiltration. In a raft system, the underside of the raft also acts as a biofilter! The raft sits in a water channel which is separate to the fishpond. So the water was flowed through the solids filter and biofilter before getting to where the plants sit in the raft. This ensures that no solids will build up on the roots and that the plants have plenty of access to the nitrates and minerals they need for healthy growth. In a raft system, the underside of the raft will also act as a biofilter. The University of the Virgin Islands (UVI) uses a ratio of 60 to 100 g of fish feed/m2 of plant growing area per day. As you can see, the more you feed your fish, the larger the plant growing area (ie raft) has to be to handle the biofiltration. If you don't have enough planting area then you may need a separate biofilter to handle the load from the fish. If you do not have enough biofiltration, then your fish will suffer with a toxic build up of ammonia. Images: Thanks to Cris Gaston for doing this experiment and allowing me to use the images. You can read more on the discussion of the results of this experiment here. This is a nice raft. Your lettuce will surely grow great. Really love aquaponics. Aquaponics most certainly works. However I use the Hydroton (expanded clay) in my systems rather than the floating beds. The more I learn about aquaponics the more I realize, there are many different ways to do this.